Following discussion of all findings, you will be given a written treatment plan, including costs. Arrangements can then be made to improve your child’s oral health by making another appointment if required. We find it works best for children if all non-emergency dental treatment is undertaken at subsequent visits in a planned way and at a time of day that is best for your child e.g. mornings. Children are less tired in the morning and their coping skills are better; therefore, the dental experience is more pleasant for them. 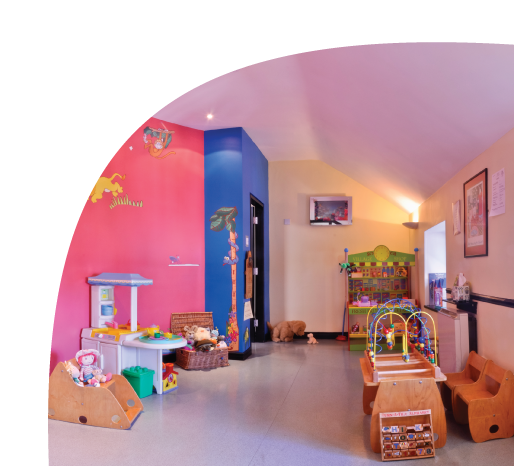 Your child’s first visit with us will take approx. 30 – 45 minutes. 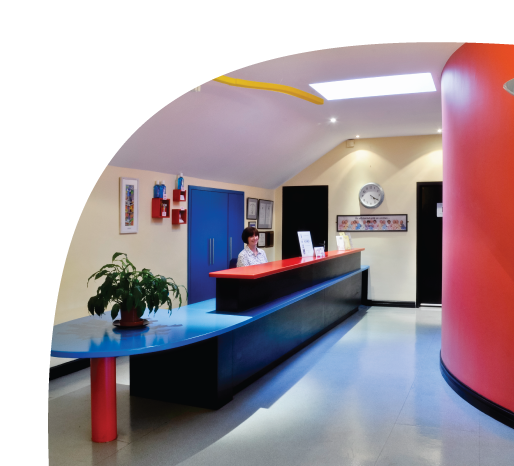 In Paediatric Dentistry, it is often not the treatment itself which is difficult but rather finding an appropriate approach to the care your child needs, which is the main objective of the consultation. Our aim is to restore your child’s mouth to good oral health in a manner that gives your child a positive dental experience. 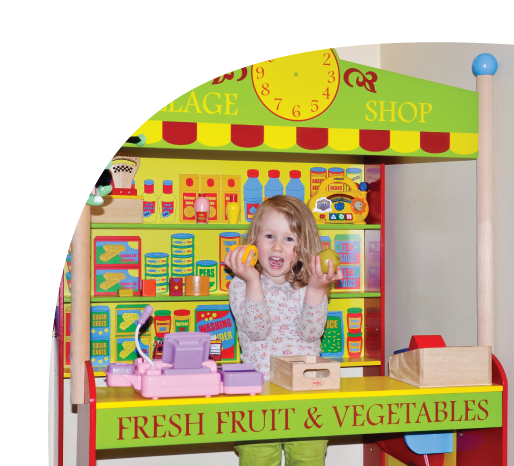 We will also give you the tools to help maintain good oral health at home until we see you again at your child’s regular 6 monthly dental check-up. X-Rays (Dental Radiographs) give us important detailed information that we cannot get by direct examination. Did you know that up to three quarters (75%) of tooth decay in children can be “hidden” between their teeth? It is best to find and treat tooth decay at an early stage – this makes dental care more comfortable for your child and more affordable for you. Dental x-rays are also important to survey developing teeth, evaluate effects of an injury/trauma, investigate areas of concern (e.g. swellings/cysts etc.) and plan for orthodontic care. With contemporary safeguards the amount of radiation received via dental x-rays is extremely small. In fact, dental radiographs represent a far smaller risk than an undetected and untreated dental problem. We take x-rays only when necessary. Why are baby teeth important? Won’t they fall out anyway? It is very important to maintain the health of baby teeth. They are the framework around which the adult teeth will grow and develop. If primary teeth are retained in good condition until they fall out naturally they will have served their purpose perfectly. Why fix tooth decay in children? Parents are often surprised to learn their young child has tooth decay. The need to treat baby teeth may be questioned because, after all, “they are going to fall out anyway”. The following information will help you to understand why it is important to treat baby teeth. Baby teeth are smaller than permanent teeth – so there is less space from the enamel (hard outer surface) to the nerve of the tooth. Therefore, tooth decay can progress rapidly. Untreated tooth decay in baby teeth may cause an abscess which can be very unpleasant for your child, resulting in pain, swelling and often the need for antibiotics. Leaving infected (abscessed) baby teeth increases the risk of damage to developing permanent teeth and other nearby teeth – resulting in the need for further dental treatment later. Treating decayed primary teeth reduces the number of decay-producing bacteria in the mouth; this lessens the risk of tooth decay occurring in the permanent teeth. Some baby molars do not fall out until children are 12/13 years of age – this is much later than many parents realise. Regular dental check-ups are important to help prevent tooth decay or intercept it an early stage. If you notice any areas of concern in between visits, it is best to attend us as soon as possible. 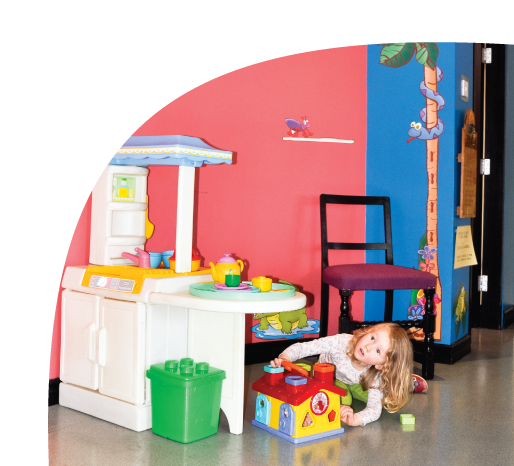 Early treatment is usually more comfortable for your child and more affordable for you. How will treatment be provided? The vast majority of children we see have their dental treatment under local anaesthetic in the dental practice. The number of visits required will vary depending on the amount of treatment needed; you will be advised of this on the day of assessment. However, a small number of the patients that we see (approx. 5%), will require their dental treatment to be completed under General Anaesthetic in Hospital. Typically these are young children who require a lot of dental work and are not able to tolerate extensive treatment over a number of dental visits. For these patients all necessary dental treatment is provided in one visit as a day-case Hospital procedure. 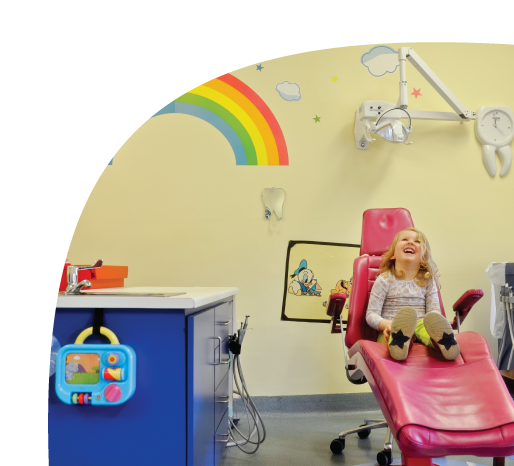 Since 2006 we have successfully provided comprehensive dental care for over 500 children in the Galway Clinic with the support of Consultant Anaesthetists. Fissure sealants are a clear or tooth coloured plastic coating applied to the deep pits and grooves of teeth. Sealants work by blocking bacteria and food lodging in these very difficult to clean areas; 90% of tooth decay in children occurs in these pits and grooves. Sealants are quick and easy to apply and also a comfortable procedure for your child. No anaesthetic or removal of tooth structure is required; the tooth is thoroughly cleaned and prepared, the liquid sealant is applied and set with a curing light. We can place a number of fissure sealants in one visit. Your child can eat and drink immediately after. Sealants last for many years and if required can be easily repaired. They are also cost-effective and less expensive than fillings. We consider fissure sealants to be one of the best preventive tools in Paediatric Dentistry. To see some before and after treatment photos, have a look at our Gallery page. What teeth need Fissure Sealants? The teeth we fissure seal most are children’s first permanent molars (6 year molars). However, many other teeth benefit from fissure sealants especially if their pits and grooves are deeper than normal. We examine each tooth individually and will advise you if we feel your child will benefit from fissure sealants. Remember – Fissure sealants can only protect the “groovy” areas of teeth. The other tooth surfaces can still get tooth decay if enough plaque and sugar affect them. What are the rough edges on my child’s front teeth? 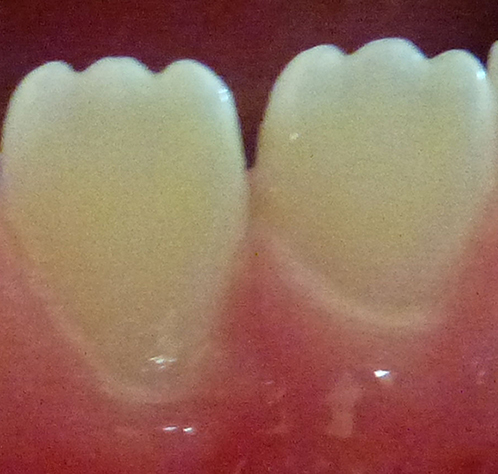 Mamelons are rounded protuberances on the cutting edge of new permanent incisor teeth. 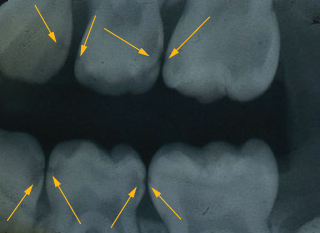 These are a normal anatomical feature of young teeth and wear away with use. (Adults no longer have mamelons). Mamelons can vary considerably in size but even when pronounced are usually of no clinical significance. 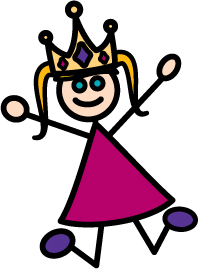 Crowns are used for children where the cavity is too large for a filling to be successful and the tooth will not fall out for a number of years. They work by strengthening and supporting the remaining tooth structure – and are very durable. Crowns are also used after root canal treatment or if a significant amount of tooth structure has been lost or damaged e.g. from trauma or defective enamel. The metal crowns we use for back teeth are made of stainless steel (they do not contain mercury). We generally use full metal crowns as we find these are the most durable crowns and there is no risk of the white facings “chipping off”. Most crowns will last for the life of the tooth; they fall out naturally at the correct time, allowing the succeeding permanent tooth to erupt into position. Brushing – Teeth should be brushed twice a day after breakfast and last thing before bed – No food or drink after. We recommend that an adult should brush their child’s teeth until they are 7-8 years of age. We find it best if a parent uses a dry brush first, cleaning teeth and gum lines – in this way parents can clearly see what they are doing without bubbles/froth hindering their view. After dry brushing, put a small (pea size) amount of fluoridated toothpaste on the brush and let your child finish the cleaning – if they are willing and able. From 7-8 years upwards children can brush with supervision from a parent or caregiver. Type of Toothbrush – Proper technique is as important as the toothbrush you use. There are two types of toothbrush, electric and manual. For children all brushes should be soft bristled and small in size. We encourage children to bring in their own toothbrushes so that we can show parents and children how to brush teeth properly. We give all children a new suitable toothbrush at their first visit. Remember: change toothbrushes approximately every 2 months or when the bristles become splayed. Most major brands of toothpaste are equally good. The active ingredient in toothpaste is fluoride which is very important in strengthening enamel (hard outer surface) of teeth making them more resistant to tooth decay. Taste – some children find the taste of toothpaste too “strong”. We can advise you of pleasantly flavoured or flavourless toothpastes – which also work well. Flossing allows you to clean between teeth where tooth brushing cannot reach. This greatly reduces the risk of tooth decay by removing plaque and debris. When teeth touch tightly together flossing is needed. It is best for adults to floss their child’s teeth once a day – night time is usually the most convenient. 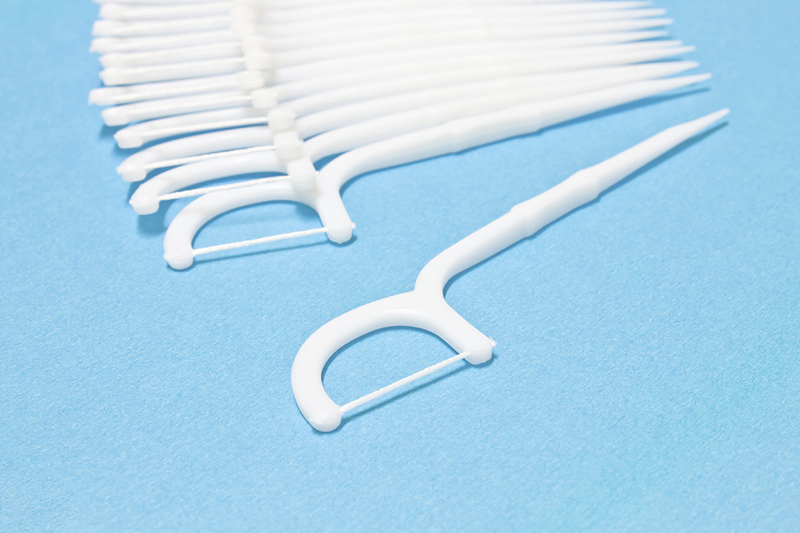 There are a number of flossing gadgets available that make this job easy – we can advise you and give you samples. acid-damaged enamel by re-mineralising it from saliva. At what age do baby teeth grow? The first baby tooth (bottom front) usually grows at ~ 6 months of age. A full set of baby teeth contains 20 teeth (10 top, 10 bottom); they are all usually present between 2½ – 3 years. The order and timing in which baby teeth grow can vary quite a bit. Please contact us on 091 56518 if you have any concerns. At what age do baby teeth fall out? The first baby to tooth to fall out is usually the bottom front one at ~ 6 years of age. At this time the first permanent molars grow behind the last baby molar. By ~ 8 years of age the eight front baby teeth (incisors) have fallen and been replaced with permanent (adult) teeth. Between ~ 8-12 years of age all remaining baby teeth fall and are replaced by their permanent successors. 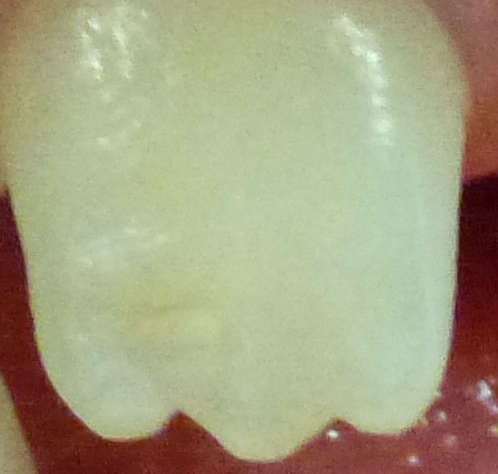 At ~ 12 years of age the 2nd permanent molars also come through. Wisdom teeth (3rd molars) usually erupt from 18 years of age. Remember: There can be quite a bit of variation in timing of both eruption (growing) of baby and adult teeth and exfoliation (losing) of baby teeth. When teeth begin erupting (growing into mouth) some babies have sore or tender gums and may be “out of sorts” or complain. Gently rub your child’s gums with a clean finger or damp facecloth. Give them a chilled teething ring to chew on. Give them some sugar-free analgesic. Remember: Teething is a normal event for all children. It is not correct to blame high or persistent temperatures on teething alone. If this happens, it is best to contact your doctor. How often should I bring my child to the dentist? He/she is not in any pain! Recall intervals vary but in general it is good to check children’s teeth/mouth at least twice yearly – every six months or so. Your child can have significant tooth decay without symptoms or obvious looking “cavities”. Mouthguards are very effective at protecting teeth and oral tissues from injury. Traumatic injuries to permanent teeth affect 20-30% of the population – often requiring extensive treatment over a prolonged period with a significant financial investment. Since January 2013 the GAA have made it mandatory for juvenile players (up to the age of 18 years) to wear mouthguards. Dentists fully endorse this initiative. It is important that mouthguards fit well and are comfortable – otherwise they will not be worn! The best mouthguard is a custom fit one which is specially made for your child. A mould is taken of your child’s teeth and sent to a laboratory. The guard is fitted on a subsequent visit. An alternative for children (when teeth are falling – and new ones growing) is the mouth formed (boil and bite) one. We can advise which mouthguard is best for your child. Please note: the cheap stock mouthguards (under €15) tend to fit poorly and are not recommended. Children – wear your Mouthguards! 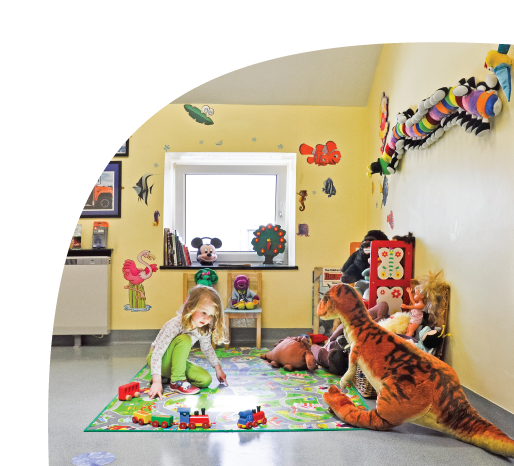 We would strongly advise that parents avail of 24 hour school insurance for their children. The fee is very reasonable and provides good cover for dental injuries.